Just like the the DIY mover, the home DIYer is a great new target audience for a mobile and self storage operator. These home DIYers are working on home improvement projects and need to have an easy solution for storing the items from the rooms that they are working on. DIYers take on their own home improvement projects (sometimes with a help of a contractor) for many reasons including to make their homes more comfortable, upgrade air or heating systems, waterproof basements and improve energy efficiency. DIYers desire to do their own home projects because they feel like they can handle the tasks given to them and they actually do enjoy doing the work. DIYers are savvy and are more concerned by using and buying high-quality products than pinching pennies. 50% of DIYers are female with 52% of them being between 24 and 44 years old. Do-It-Yourself or DIY has continued to be a very popular hobby for the home with no end in sight. The target DIYer actually is similar to the target audience for the self storage industry, making this a great potential customer audience for a mobile storage business. Simply drop off a mobile storage container to the DIYer’s home, let them pack or unpack at their own pace, then pick up the container when they are done. It is easy for both the DIYer and the mobile storage operator. Adding the right mobile storage delivery system for a mobile storage business will not only reduce a mobile storage facility’s manpower expenses, it will also increase rental revenue. Having the right type of truck and mobile storage delivery system is important to having a great mobile storage experience for both the customer and storage operator. For consumers, the storage container moving and packing process is much easier with the Horizontal Lift portable storage lift system. The mobile containers are placed on ground level, which allows the renter to easily walk their items into the storage container when it is being packed or unpacked. A mobile container truck will allow for easy transportation of a portable container to a storage facility or to the customer’s new home. Compared to other mobile storage delivery equipment, Horizontal Lift leaves consumers belongings intact with the “no-tilt” lift system. The Horizontal Lift system is a patented storage container delivery system that can be used on different sized mobile storage containers. The mobile storage lift system is easy to operate, durable, dependable, and hydraulically operated. The lifting lug that is used in a Horizontal Lift system is developed to have an easier transition between container sizes allowing for a secure attachment to the containers on the trucks. 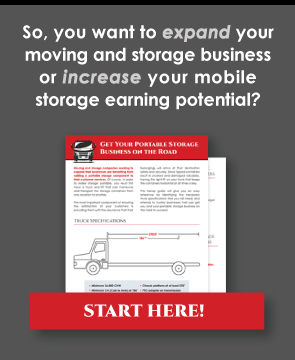 Adding the mobile storage delivery equipment can help expand a mobile or self storage business beyond your local community and help increase revenue for your business.